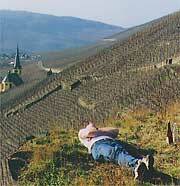 Taking a sun break in the vineyards above my hometown of Zeltingen-Rachtig. Ewald Moseler selects fine wines from Germany and Austria for import and distribution by Premium Vintage Wine Company. Top-quality German wines have been gaining in popularity in the United States because of their improving quality, their naturally lower alcohol and the continuing strength of the dollar. And Austrian wines are very hot right now because their amazing quality and individuality is just being discovered by American wine lovers. But there are so many wines out there, how do you decide which ones to try? That is where I can help. I have sifted through hundreds and hundreds of German and Austrian wines to find the best in taste and value. Please take a look at my list of wines and have your local wine merchant call me to get any wines that interest you. I grew up with wine. As a boy living on the Mosel River in Germany, I was always somehow involved with the winemaking going on in my village. Zeltingen-Rachtig is right in the heart of the best vineyard area of the whole Mosel valley, so I grew up with some of the finest white wines this world can produce. Before I was old enough to help with the actual harvesting, I would carry a big bottle of wine through the vineyards to replenish the spirits of the workers. Naturally, I had to try a little myself, and since then I have been madly in love with that special kind of Riesling that can only be found in Germany. Mosel wines will always be my favorite, but since my childhood, I have discovered some truly remarkable wines from the other regions of Germany and Austria, as well. Each wine-growing area has its own special characteristics, and each is capable of producing exceptional wines. The trick is to separate the really dedicated and talented producers from the merely average one; a trick not so easily performed because of the huge number of winemakers in Germany and Austria. You could spend a lifetime tracking down the wines that are the best. But you don't have to, because I have already done it for you! I have spent a great deal of time researching and tasting the wines of numerous producers in the important wine regions of Germany and Austria. That, combined with my lifetime of experience with Mosel wines, has enabled me to assemble my personal selection of German wines, all of stunning quality, and many that are unequaled values in fine wine. These are Ewald Moseler Selections. In 1985, I set up shop in Portland, Oregon, to distribute these personally selected wines in the Pacific Northwest and to import them for other wine distributors nationwide. I am pleased to be able to offer you the very best of one of the finest things my homeland can create. I would like to keep them all for myself, but I firmly believe that these wines are just too good to keep bottled up!